Nefesh Music's Jewish Orchestra service was created to provide the best Jewish simcha music and American music possible for weddings, Bar/Bat Mitzvahs and special events. Something that truly defines Nefesh Music Orchestra is our charisma and our ability to inspire people to become actively involved in your event. 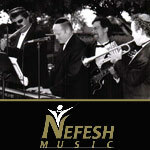 Nefesh Music is zealous in ensuring that every event is fun, classy, exciting and memorable. We pride ourselves on the fact that when people leave our events, they always want more of the Jewish wedding music. Our musicians are the finest in the world and have toured with many famous international artists. Each musician in our orchestra is a bandleader himself/herself and knows how each event should be coordinated and conducted. Nefesh Music has traveled throughout North American cities, including Seattle, Chicago, Houston, Las Vegas (Elvis costume not included), Denver, Boston, San Diego, Portland, Phoenix, St. Louis, and New York City. We can travel to any location where music is needed. The founder and head bandleader of Nefesh Music is Brad Schachter. Brad has entertained international audiences with his captivating style of music. Brad's harmonious blend of various styles of Jewish and American music has already gained a wide, enthusiastic audience from high school students to professionals. Get more for your wedding! Don't forget to mention ChossonKallah.com when visiting Nefesh Music.